The beauty of sport is that, usually, there’s always that next game. But there are certain occasions when there’s no tomorrow. 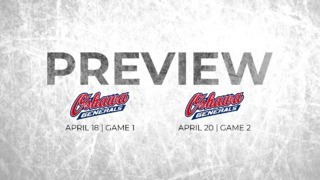 The Ottawa 67’s take on the Hamilton Bulldogs in Game 5 of the OHL Playoffs knowing that if they lose this game, that will be end of this run. The 67’s trail 3-1 and will have to beat the Bulldogs in their own den to extend this playoffs battle. Despite the deficit, the 67’s will go into this game knowing that they can pull off the required win. They have shown their ability to tear up the script during the regular season and extended that into the playoffs. 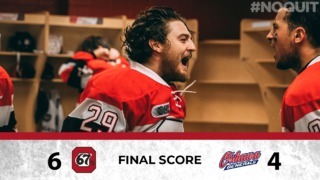 The battle between the Bulldogs, the Eastern Conference champions, and the 67’s, the team that finished eighth, was expected to be a one-sided one. But the young Barber Poles have shown that they have the mettle and the confidence to take the battle to their superior opponents. Except for Game 3, they have been up to the task and if it weren’t for conceding a few easy goals, the score line could have been very different. Ottawa will be looking to replicate that and convert more of their chances in this do or die Game 5. The highlight of this playoff battle has been the standout performance of Noel Hoefenmayer. The 67’s defenceman has seven points in the four games. Travis Barron and Sasha Chmelevski have four points each as well, while rookie Sam Bitten tops the 67’s goal scoring charts with three goals in the four games so far. The 67’s will need their top line to step up and deliver. The defencemen, at the other end, will have to find a way to stop Hamilton’s Brandon Saigeon from scoring. He leads the charge for the opponents with six goals so far. The other player to watch out for is Robert Thomas who has provided six assists in the four games. The Barber Poles know that it will be tough outing for them but they can take inspiration from their performance in a similar situation last season. During the 2017 playoffs, the 67’s were trailing 3-1 against the Mississauga Steelheads but they produced a steely performance to defeat their opponents 5-3 and extend the quarterfinal series. 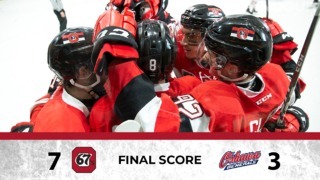 The 67’s have pulled off in-game turnarounds during the regular season, when they have fought back from being 2-3 goals down to pull off memorable wins. If there ever was a time to invoke that fighting spirit, that would be now. Game on.